This special offer includes accommodation for 2 persons in a Junior Suite Deluxe Double Canal View with full amenities, pre-theatre aperitif and snacks at the Hotel A La Commedia and 2 central box seats on first circle in the Fenice theatre or second gallery in the Malibran theatre to enjoy the “premiere” of the opera from a superb and exclusive position. In order to check the availability of this offer through our booking engine at www.hotelcolombina.com , the dates of the premiere performances are herewith listed. Access to the Theatre and starting time of performances: Doors open at 6:30 PM and performances start at 7:00 PM. In case of late arrival at the Theatre entrance to the box is not allowed until the first interval. Cancellation of Performance: In case of cancellation of the performance by the Fenice Theatre organization , the Hotel will offer a compensation. 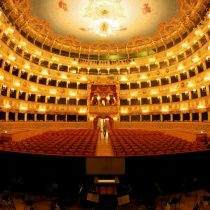 Dressing Code: There is a dressing code for the premiere at the Fenice and Malibran theatres. We would advise that guests dress smart. Suit & tie. No jeans or trainers, no t-shirts. We look forward to welcoming you to Venice and making yours an unforgettable experience of your life.